Visit Tanzania and take part in hiking the Kilimanjaro via the Lemosho route on this 7 Days Lemosho Route Kilimanjaro Hiking Safari. Contact us to book this safari. After breakfast and a briefing guide and mountain crew will arrived at your hotel in the morning in order to meet you and hold another briefing, after which you will travel by vehicle (roughly 3-4 hours) to Kilimanjaro National Park`s Western entrance: Londorossi Park Gate 2,200 m. After the quick formality of acquiring climbing permits and registering with the search and rescue service, the group continues upwards towards their drop off point by off-road vehicles (reaching 3,500 meters). Here you can see stunning views of the Shira Plateau for the first time. The route from your drop off point to your first high-altitude camp Shira 1 features a moderate gain in altitude and is not too physically challenging. Due to this, you will be able to properly begin the process of acclimatization. By the time you reach the camp, our professional mountain crew will prepare everything necessary, put tents and cook dinner for you. 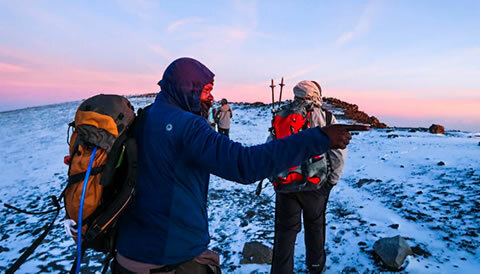 Today is your full day exploration of the Shira plateau by trekking from Shira 1 Camp (3505) towards the second high altitude camp Shira 2 (3900 m) as is the best place to see Mount Meru depending on the weather. The trek is not that much difficult and you will be able to see view of Africa and the unique flora and fauna of Kilimanjaro and surrounding area. You will arrive for lunch and after 2 hours rest you will complete acclimatization hike towards Lava Tower Camp that features a 200 meter gain in altitude. A long trek from Shira 2 Camp (3,900 m)to Barranco Camp (3,960 m). This route has a lot of ascents and descents at over 4600 meters. It might be difficult, and you may feel some discomfort, but in order to successfully acclimate to the altitude you have to spend at least 1–2 hours here, so this is where lunch will be. Here you can see the famous Barranco Wall, impressive in both its massive size and steepness! End of the 7 Days Lemosho Route Kilimanjaro Hiking Safari.